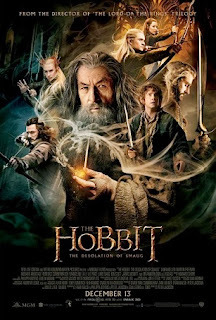 Bilbo Baggins and the Company of Dwarves continue their quest to reclaim the Lonely Mountain of Erebor for would-be dwarf king Thorin Oakenshield in THE HOBBIT: THE DESOLATION OF SMAUG. The second chapter in Peter Jackson’s tripartite prequel to last decade’s acclaimed THE LORD OF THE RINGS saga will be revered with the best middling movie installments for its effectiveness in fleshing out characters we’ve already met, thrusting them into knuckle-whitening new perils, and setting up narrative dominoes we know will topple next time out (or saw unfold already in LOTR). Don’t worry if you’re a little hazy on your Tolkien. Like his celluloid LOTR adaptations, Jackson’s HOBBIT films are as long and winding as the journeys undertaken by their protagonists, and it’s easy to get lost among the colorful characters and fanciful places—or forget a few plot points between outings. Suffice it to say, last year’s inaugural entry AN UNEXPECTED JOURNEY saw our titular halfling (Martin Freeman) recruited (for his exaggerated burglar skills) to help Thorin (Richard Armitage) and a dozen other dwarves reclaim their kingdom from slumbering dragon Smaug, who now guards Erebor and its vast treasures. The plucky band of would-be heroes was set upon by trolls, a hideous orc army, and ravenous warg-hounds, and were nearly crushed betwixt (yeah I said betwixt) a pair of angry mountains that rumbled to life. The dwarves not only escaped, but managed to cover some serious ground—thanks in part to Bilbo, who found a mysterious golden ring along the way. Following a barroom flashback wherein sagely sorcerer Gandalf (Ian McKellen) urges Thorin to embrace his destiny, DESOLATION OF SMAUG resumes right where JOURNEY left off, dropping us back with the travel-worn dwarves at Carrock. Relations between the dwarves, elves, and humans remain tenuous at best. Elf-king Thranduil (Lee Pace) doesn’t care for dwarves—but the feeling’s mutual: Thorin resents the elves for abandoning his grandfather’s people in battle to Smaug and the Orcs years ago. While Thandruil concedes that Erebor is Thorin’s birthright (since it was wrested from the dwarf family line of Durin), he doesn’t much care whether retaking the mountain restores the harmony between their races. Only, now there’s much more at stake than Thorin’s throne. Gandalf has detected the return of a powerful new evil—a Necromancer—whose reawakening threatens all of Middle Earth. Gandalf leaves Bilbo and the dwarves to confront the vaporous villain alone at the orc stronghold of Dol Goldur (after a brief palaver with woodsy wizard Radagast), but Thranduil still isn’t ready to nudge his pointy-eared people from their rustic sequestration to assist. He regards himself and his long-living progeny—including son Legalos (Orlando Bloom)—as superior to other creatures, and therefore worthy of a protracted (if imaginary) independence. Who could blame him for not dabbling in the affairs of dwarves and men? Immortality breeds complacence. That changes when Thranduil’s beautiful bodyguard Tauriel (Evangeline Lilly from Lost) takes a liking to one of the dwarves and ventures after the pint-sized pilgrims. Legalos, who fancies the auburn-haired archer, defies his father by giving chase. Together, the elves protect Thorin’s crew from vengeful one-armed orc Azog and his battle-hungry son, Bolg. The film’s most exciting sequence finds the pair whizzing arrows (with mind-blowing speed and accuracy) at orcs along a riverbank as Bilbo and the dwarves ride the raging water in wine barrels. Emboldened by his secret ring, Bilbo proves just as lethal with his enchanted sword. A shadow of his former timid self, the unassuming hobbit racks an impressive body count in this episode, unflinchingly eviscerating orcs and impaling enormous arachnids at every turn. But Bilbo’s tiny cargo weighs heavy on his heart: The more he takes advantage of the “One” ring’s power of invisibility (just as Frodo did, er…will do in LOTR), the more irascible and paranoid he gets. Baggins becomes possessive of the jewel (echoing Gollum’s “Mine!”), doesn’t disclose its cloaking ability to anyone, and even lies when given an opportunity to divulge the truth to Gandalf (and Smaug). The transformation isn’t lost on the sorcerer. En route to Erebor, Bilbo and friends encounter Beorn—who can shape-shift into a bear—and befriend Bard (Luke Evans), a boatman who offers shelter at Long Lake, a fishing village beneath Lonely Mountain. Turns out Bard is just as haunted by family history as Thorin, but he’s too preoccupied quarreling with the town’s drunkard dictator (Stephen Fry) to reconcile his past until fate intervenes. Once circumstances split the dwarf party, Jackson and his writers hopscotch neatly between Bilbo, Gandalf, and the gang as they embark on their respective mini-adventures. Will Thorin know how to use the key to enter Erebor when the time is right? Can Bilbo retrieve the glowing white Arkenstone from under Smaug’s snout and restore the dwarf’s rightful reign? Can Gandalf suppress the Necromancer and its growing orc army long enough for Bilbo and Thorin to succeed? And how will Bard, Legalos, and Tauriel acquit themselves when the evil armies descend upon Dale? Hey, it wouldn’t be any fun if we told ya. DESOLATION OF SMAUG suffers from a bit of the visual “sameness” pervading LOTR and AN UNEXPECTED JOURNEY. We spend a lot of time in caves and under cover of night. The color palate is limited, with mottled grays and browns predominating, and the river / barrel chase being both the only significant outdoors / daylight sequence. We’re “treated” to more lingering overhead shots of characters hoofing it single-file over various landscapes, and while we know it’s supposed to feel sweeping and cinematic, one is repeatedly struck by an underwhelming sense of, “Oh, another rocky mountain / barren field / dark forest.” Sometimes the sheer scale of it all works against the cinematographer, exposing telltale digital fingerprints in the FX (the 3D only adds to this). The younger Legalas’ eyes are creepily bluer than in LOTR. No matter. It’s what Jackson and his players do with these characters and locales that make SMAUG spark like the rest. The director again utilized a high frame rate for the picture, and while we can’t spot the difference between 24fps and 48fps any more than we can hear the difference between 256kps and 360kps mp3 files, we can attest that the end result looks fantastic and otherworldly onscreen. The 160-minute epic moves briskly enough and the kinetic action pieces excite the senses. The characters are still convincingly short / tall, (owing to special effects and tricky forced perspective camerawork), and the computer-generated beasts are frightening. There’s ample magic and swordplay (we lost count of the decapitations at five or so), injections of humor to maintain or restore levity, and sufficient narrative to keep us invested in the mayhem. Howard Shore’s sweeping music amplifies the emotional resonance of every image. Freeman and McKellen are solid, but the script affords Armitage, Lilly, and Evans the bulk of the dramatic material here, and each delivers. Benedict Cumberbatch lends an appropriately sibilant baritone to the slithery dragon, but we were surprised how easily his scaly monster is tricked into monologuing like a Bond baddy (we wouldn’t be at all surprised if the SHERLOCK star is one day summonsed to vex 007). Jackson brings the proceedings to an abrupt halt just as the proverbial Warg-dung is about to fly. Enthusiasts will either love or hate the cliffhanger climax, but they can’t deny how well it works, leaving moviegoers hungry for more hobbit. Oh, and watch for Peter’s cameo very early on. 3 out of 4 stars.